Spectacular and beautiful cover, duplex apartment, new, fully equipped and furnished. integrated kitchen environments and gourmet terrace, interact with the living room, providing comfort, conviviality and relaxation, starting from a combination of functionality, elegance and relaxation. 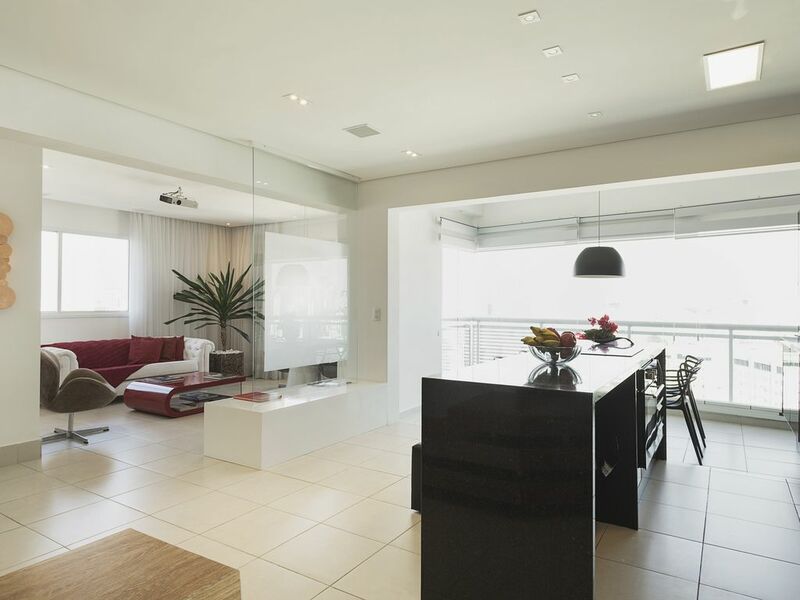 Excellent for executives who need quiet and rest after an exhausting day of work, or for those who want to do tourism or business in São Paulo, without losing the comfort of a villa. Or, for those who are adept cuisine and want to make your own dinner and taste it in a nice and cozy atmosphere. The apartment has 2 suites. Upstairs, the double suite with queen size bed, is provided with a window / door that opens onto a balcony discovery that provides a 180 degree view of the city. The other suite is downstairs and is furnished with two single beds. All rooms have a light and natural ventilation, extremely healthy. The building is modern, with concierge and 24 hour security and has the concept of facilities and concierge services. Some basic cleaning services are included in the condo fees and other services are available in the system of pay-per-use. It has two swimming pools, but only available for guests staying longer than 30 days; gym, games room, room with computers and internet, playroom, party room and barbecue area, plus a beautiful laundry. No parties or events allowed in the apartment. The use of the barbecue and party room is for the exclusive use of permanent residents. Guests can use the basic cleaning services or hire other services in the system of pay-per-use. Basic cleaning services consist of: storage of beds, cleaning of restrooms (except inside the stall) and disposal of garbage. Important. I will leave a copy of the Internal Regulation of the Condominium in the TV rack so that the guests know and follow during their stay. Generally are healthy rules of behavior in society and compliance with laws, especially the morals, of silence and social life in residential condominium. Respect their operating hours of the common areas of the building, especially swimming pools, sauna and gym, and whenever you attend them, seek to use their own towels for such sites, which are the darker color that will find in the cupboards. The use of the gym should be done with common sense, to enable the relay of the devices with other users and the use of mats is restricted to 30 minutes at a time. The use of the parlor spaces and barbecue area of ​​the building are only allowed by advance booking of the owner, for payment separately. Make conscious use of materials made available, given the water crisis through which we and respect for nature. This is: please avoid excessive washing of bedding and bath, unnecessary, prolonged baths and excessive lights. We provide bath towels, face and hand, and complete trousseau bedding, sufficient for the number of guests, and left several other sets, spare parts, mainly to meet the next guests. Guests have free access, if necessary, especially in longer hosting. But the conscious use is key. To the women, we ask, please, do not make use of the towels to remove the makeup, lipstick and much less to dry hair with recent tincture. The building is selective collection of garbage in two categories: organic and recyclable. We asked the hosts take care to put the waste into two separate bins, according to the nature, inside the apartment. The building has garbage collection service the apartments daily from 8:00 to 9:00. Anyone who wants to use this service, please put the TAG on the door saying to remove or not. And if the guest does not want the trash to be removed from the apartment, he should take it to the floor -3 and put it on the spot. The condominium offers basic cleaning service consisting of cleaning the bathroom (except inside the box), removal of trash and turndown (excluding exchange). If the guest wants to use, it is necessary to ask the Administration by filling out a short form, which indicate the days and times. Also other pay-per-use must be obtained from the authorized company providing services in the building, which provides a list of services and prices. The contact can be requested from the Administration. As the host, I blame me for the cleaning and organization of the apartment before and after leaving the host. If the guest stays for more than a week, and want to appoint in the cleaning services during your stay, the guest needs to express and negotiate separately the value of this service, days and times. Box with showers. The bathroom of the master bedroom has hot water to gas and single bedroom bathroom has hot water, served by electric shower. The condo provides basic housekeeping (cleaning toilets, except inside the box), removal of trash and turndown, included. If the guest wants to use this service, we only schedule the administration stating the days and times. There are also payper-use services. Pricing information, check the administration. Both positive and negatives on this location. Very roomy and with lots of closet space and lots of room downstairs and outside on the terrace. However, none of the knives in the kitchen cut, I had to go out and buy some, They also dont have a way to dispose of trash other than to pile up the bags by the door and wait for the made service every morning to come and if you are not there then it stays in the apartment and more piles up for the next day. The washer and dryer work on a chip system which you must go to adminsitratio and then they have to get authorization from the owner in order to have chips released to you to use the laundry. In the laundry room only 3 washer s and 3 dryers out of 10 work for the whole condo building which is 24 floors high with 2 towers of 4 units per floor ( can imagine ) we had to wait till late at night to get things washed. In addition the elevators are very small and only 1 is reg the other is a service elevator. The positive side is that all staff is very nice and theplace is always kept clean. The game room and pool look great but the water was very cold. In addition the exercise room closes every day from 12pm to 3pm for cleaning. The curtains in the actual apartment are all stained and havent been washed in a very long time. The bathrooms are very small and every day bugs came up through the pipes in each bathroom. The sink doesnt drain properly in the master bedroom. The wholeplace is very cold and has no heating system. Is smalls very damp in the master bedroom. The furniture is stained and the linens wer not clean and they are old. There was still the bath robe in the dryer when we arrived. All the kitchen appliances with exception of the blender worked well. I had to buy one of those too. The tv never worked and the wifi was spotty at times. The property owner did call us back or textus back but not very quickly. I would recommend this location but not for the price I paid. I give it 3.5 stars its just that I cant place a half above. We recently stayed here for three nights. The place was just as it appears in the photos. The views of the city were stunning. Everything we could have wanted was in the apartment. He grocery store was a short walk around the corner. I highly recommend this place if you are staying in Sampa. Apartamento mto bom, atendeu nossas expectativas e necessidades! Apartamento TOP, mobilia linda e funcional, super seguro tanto pra acessar o predio tanto para com crianças, muita roupa de cama e toalhas e talheres disponiveis, a feirinha aos domingos é super simpatica, elevadores rapidos(Afinal, é cobertura). Só fica uma ressalva: estava tendo cheiro de gas, então é bom que voces verifiquem pois pode ser perigoso. E uma reclamação : o Apartamento não da pra 8 pessoas, DE JEITO NENHUM, quando muito dará para 6 pessoas e vai apertar. Tem um quarto pra casal e um quarto com camas separadas e um sofá preto sobravel PEQUENO(adulto, mas pequeno). Disso eu realmente nao gostei. Amei! Não tinha como ser melhor! Próximo de muitos pontos turísticos da cidade! Recepção atenciosa! Apartamento lindo, acomoda com conforto, tudo de muito bom gosto, bem localizado, acessibilidade boa, ah, e a vista...inenarrável!